I’m going to start this article with a full disclosure – I am a young millennial who has recently found myself working in insurance. And in this industry where I’ve been frequently told that the average age of a Canadian insurance advisor is 62 and steadily growing, I have come to quickly realize that people from my generation are largely outnumbered here. Administration – like it or not – is a key component to the success of any business, including being a successful Advisor. As an insurance professional, the idea of “administration” encompasses many things; but can be categorized into two large buckets: client & business management and operational requirements. As an active licensed advisor, you are an insurance professional. You have acquired certifications and continue with ongoing education, spend time honing your presentation skills, keep current on changes in the market and on new products, you are great with clients and have refined the ability to make complicated concepts understandable no matter your client’s financial acumen. Being client focused also means that you have to keep in touch with your clients and be aware of their changing needs. This is what you do well! So how much do you love administration? Today, many organizations strive for efficiencies, real time responses and focus on making things fast and simple for users. Translation: more and more industries embrace technology and process automation. The insurance industry has started to incorporate more technology solutions into various segments. There are client facing insurance tools, electronic applications, quoting services and aggregation of data as it relates to insurance customers. As APEXA continues to gear up for our system launch, by now you’ve likely learned about the APEXA system and how we’ll be changing an industry. APEXA is a web-based portal for advisors, MGAs and Carriers, and is the trusted solution for the Canadian life insurance industry, to elevate and standardize the processes of contracting, screening, monitoring, and Advisor compliance. Earlier this week I took part in APEXA’s official training days whereby the business leads, and soon to be expert users of APEXA, got to use the system, familiarize themselves with all its capabilities, and practice what it would be like to officially onboard advisors once the system is launched and fully up and running. While I was logged in to APEXA (or simply connected), it got me thinking about the new age of life licensed advisors and what that landscape would look like. APEXA really is a game changer for our industry, one that I’m really grateful to be involved in. We’re leading the way for life advisor contracting and screening by 1 - making it fully digital and 2 - connecting everyone in an industry that previously operated in silos. Robo Advisors – How will they impact you? Welcome to the 3rd installment of my 3 piece series, 3 Topics for the Modern Advisor. To recap the first segment examined Gen Y, Gen X and Baby Boomers, followed by a look at Social Media who in the industry is using it and how. Now it is time to consider the robo advisor. 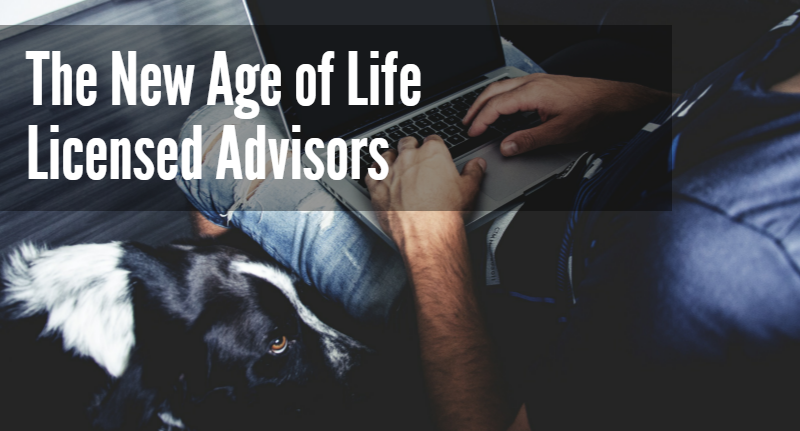 Everyone is talking about how Robo advisors will change the landscape of the industry. This is a topic that is still under debate, the what, who, why and how of the Robo Advisor. Let’s start at the beginning. What is a Robo Advisor? Who is Using Social Media? Are You Missing the Party? To continue my three part series: “Three Topics for the Modern Advisor” I am going to take a closer look at social media and how it impacts your clients and your business. We already learned that Gen Y, Gen X and Baby Boomers have different online and social media habits. However, they collaborate with their advisor using technology and research and buy insurance online. When looking at social media the questions that arise include: who is using social media, how is it being used and are you missing out if you aren’t creating your own social media footprint? The answer to our first question is simple, many people in the insurance industry are using social media: consumers, brokers and insurance companies alike. In our ever-changing, fast paced and technology-driven world, Life Advisors are in a constant balance between prospecting for new clients with relating to the ones they currently have. With publications and new information continually being uploaded to the web, what exactly should be on the modern advisor’s radar? The honest answer is, lots of things really, but in this series we will look at three inter-connected concepts that we know will benefit advisors working in today’s business environment. Gen X, Gen Y and the Baby Boomer – Who are they? Social Media, who is using it and are you missing the party? Becoming A-Listed: How Advisors Can Get Ahead of the Curve? You’ve likely heard about the industry-led solution and web based platform, APEXA. And you may have learned that MGA’s and Carriers across Canada have joined APEXA as part of ourofficial launch later this year, with many additional MGA’s and Carriers scheduled for onboarding and rollout throughout 2016. So how can Advisors get on-board with APEXA, stay in the know, and learn more about this web-based platform BEFORE the official launch?